All Images Sail NC / OceanImages.co.uk - Peter Johnstone is an avid catsailor and has been riding A-Cats since the 90s, he is also the owner of Gunboat. 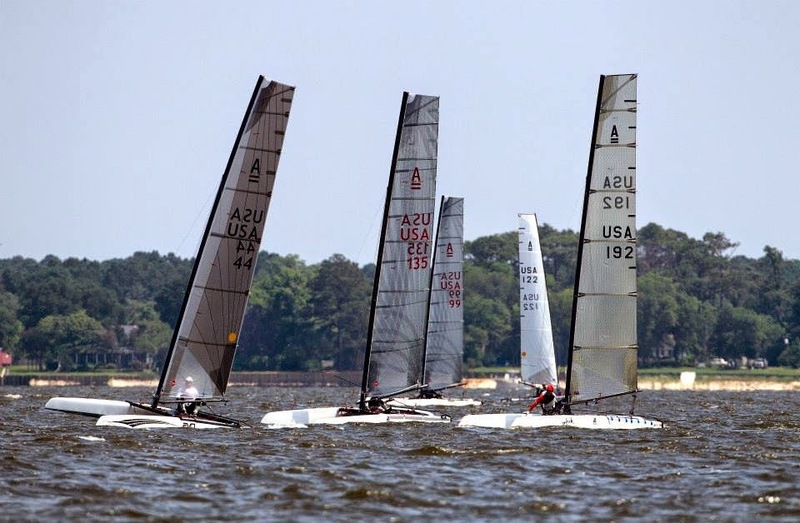 This year the North Americans were held near his GB facilities in North Carolina, at Sail NC. The sailors reported nice weather conditions plus the chance to surf every day in the Outer Banks. Now the US Class together with the Club will bid in the future to host a Worlds Championship at the same venue. Below a complete and detailed report by Peter with comments on the venue, equipment and racing. 2014 A-Class North American Championship. Largest Ever! 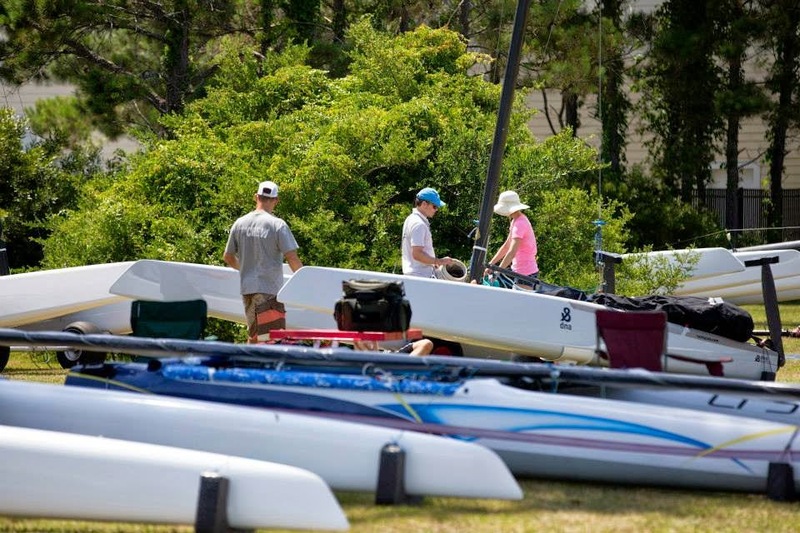 "SAIL NC should be applauded for their first regatta hosting effort. 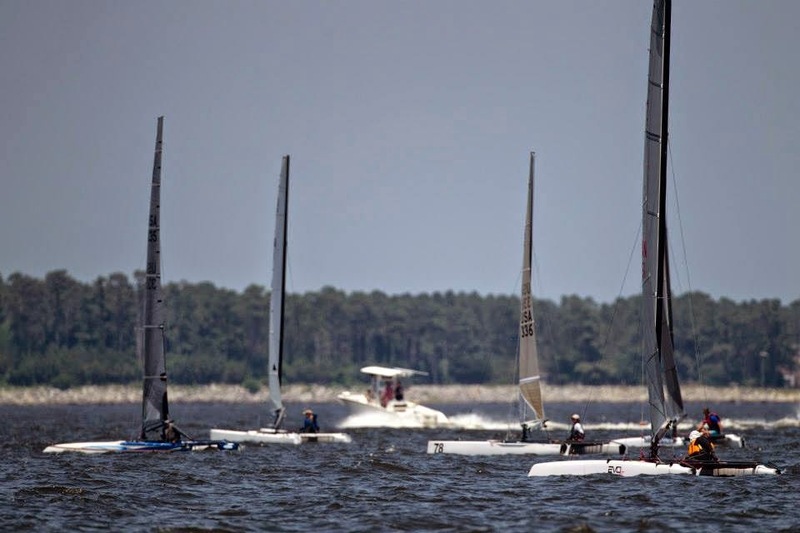 This new not-for-profit sailing entity based on Roanoke Island, North Carolina really set a new standard for hosting a high level regatta. Parties were exceptional, the media effort was professional and prolific, the host volunteers always had smiles and a welcome attitude, and the sailing site is ideal. 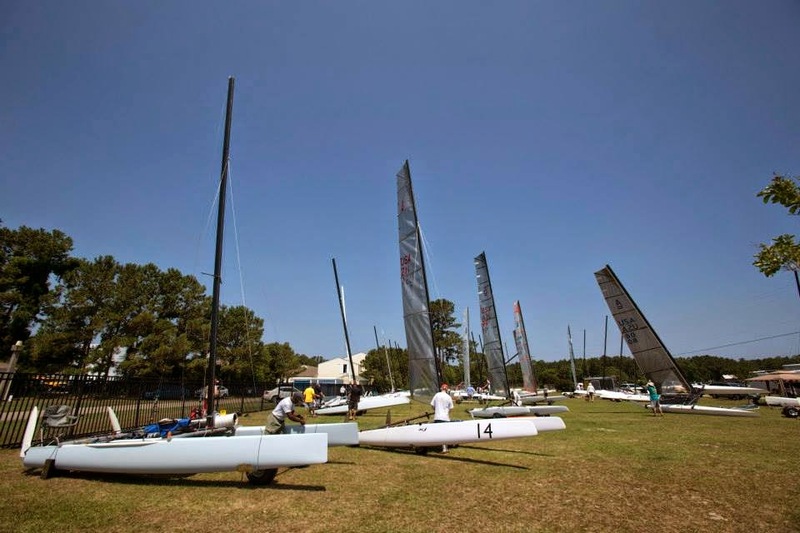 With acres of golf-course-like lawns to rig boats, a wide launching ramp about five minutes sail from the start line, and a three mile basin to set a course, it is difficult to imagine a better regatta site and host. 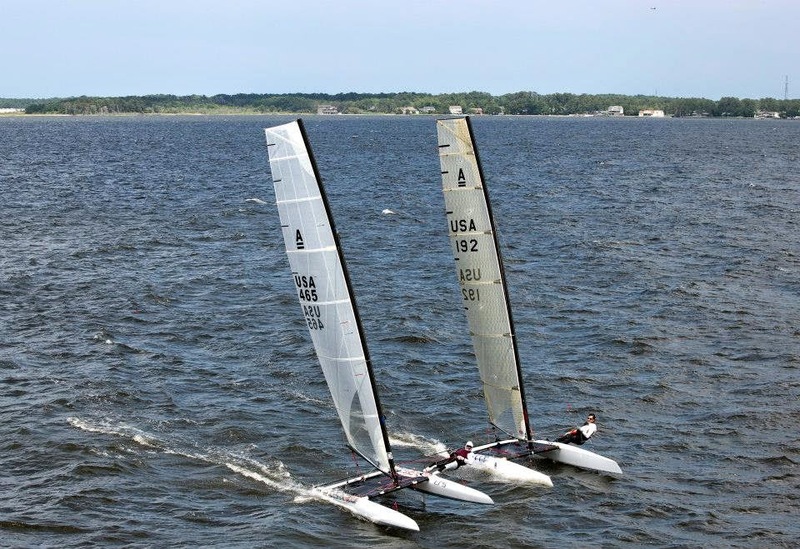 SAIL NC’s Bob Peele and Barry Wickre are off to a great start. May many more regattas head their way! The weather conditions..
for the A-Class North Americans were challenging. The Outer Banks are renown for the highest average wind speeds on the East Coast of the USA. Those high average winds depend on the Bermuda High being established in the Atlantic Ocean. The gradient typically blows from the Southerly quadrant at 14-18 knots every day. For this regatta, the Bermuda High did not establish and a stationary front played havoc with the conditions. Runner-up Ben Moon commented that the sailing area was much more lake-like. The first day featured light and shifty Southerlies. The second day was variable due to a strong of storms just inland, hence no racing. The third day featured Southerlies between 16-25 knots, and were the most typical conditions for the area. The final day featured a post frontal and building Northerly between 9-15 knots. In summary, the conditions tested the sailors in a wide range of conditions, and the best clearly rose to the top of the leaderboard. Much has been discussed regarding the changes and direction of the A-Class given the infancy of foiling, and the rapid pace of development. The North American Championship fleet featured a wide variety in vintages, builders, spars, sails, and foils. Yet despite the rapid development, and perhaps being 3-6 months behind the European developments, this fleet showed a wide range of boats going similar speeds. Eight of the top eleven boats were DNA platforms. Notable exceptions were the homebuilt Herrin in 3rd, and the Nikita in 4th place. Eight other builders rounded out the top 20! J-boards were first and 11th. The C-boards filled in most of the top 20, with a handful of straight boards still making the top. Knowing your boat and tuning it right still proves more important than the latest technical development. Perhaps the A-Class’ biggest strength is its ability to handle a wide range of ages, sailor sizes and fitness. 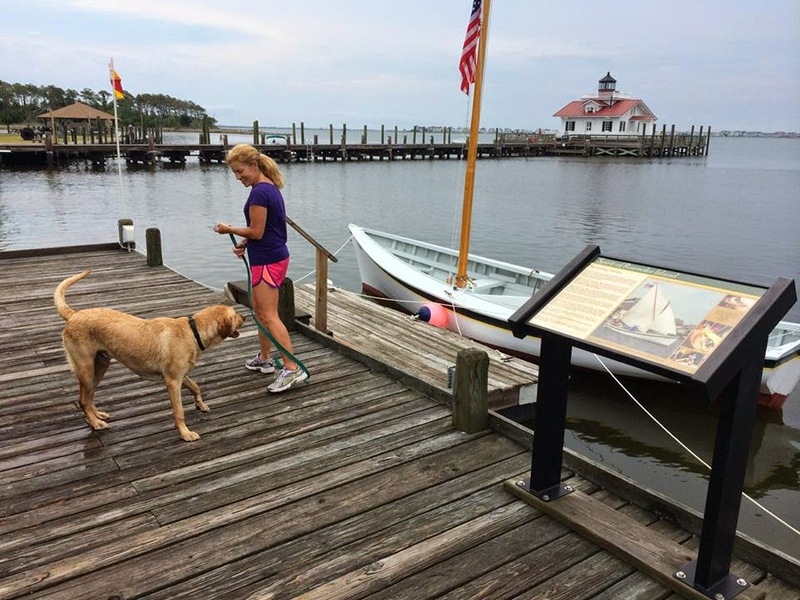 Two teens sailed notable regattas. 18 year old Jeremy Herrin came close to winning on his home built A-class. Herrin will be one to watch in the coming years. Expect to see this modest and exceptionally talented teen make the professional ranks soon. 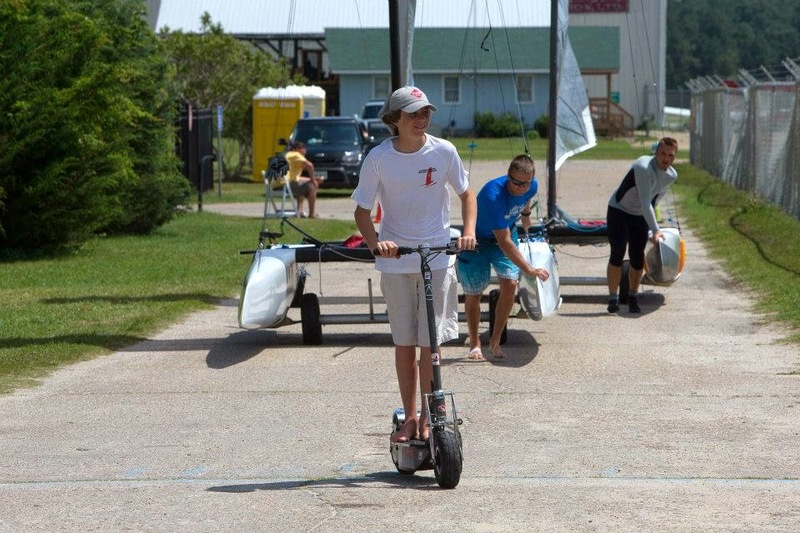 Galt Oliver at age 14 is likely the youngest A-Class continental championship competitor ever. With gusts topping 30 knots on Friday, the young Galt ably handled the conditions with a smile and motivation. Closing in on his 80th birthday, Gordon Isco successfully completed the regatta also with a smile. What sets the A-Class apart from the moths and skiffs is the ability to chill out between races. The stable platform makes it attractive to a wide range and for the long term. Isco commented that he thought he had been to ALL of the North American Championships. On to the champions. 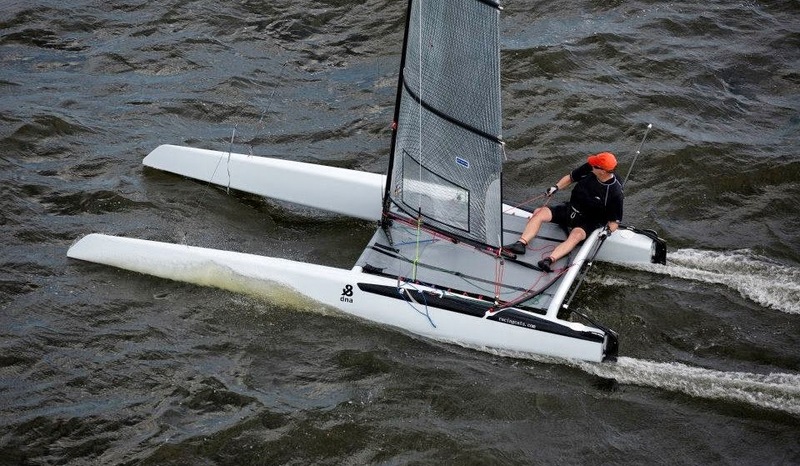 Bruce Mahoney, Ben Moon, and Jeremy Herrin put on a fantastic show through the whole regatta. These three sailors were typically found at the top and on form with few mistakes. Bruce showed foiling form off the wind. While they played a clash of titans at the top, us mortals battled it out for the rest. As with all non-Olympic high performance classes, the A-Class has a camaraderie and closeness that rewards simply being there. It is not so much about the final result, as the shared experience with terrific people, sailing exceptional boats in a great sailing area. Long from now, we will remember the waters, the sailing, the good times, and big smiles.